Two years after breaking the 200 lumens-per-watt (LPW) R&D efficacy barrier, Cree, Inc. delivers another industry first with the introduction of the Cree XLamp® MK-R LEDs. The new MK-R LEDs leverage the SC³ Technology™ next-generation LED platform to deliver up to 200 lumens-per-watt (at 1 W, 25°C) LEDs. The new MK-R LEDs make the next generation of 100+ lumens-per-watt system possible for high-lumen applications, including outdoor and indoor directional applications, such as halogen replacement lamps. MK-R LEDs are available in EasyWhite® color temperatures, providing the LED industry’s best color consistency for designs that use only one LED. For systems that use multiple LEDs, MK-R enables manufacturers to use fewer LEDs while still maintaining light output and quality, which translates to lower system cost. The MK-R LED features a 7 mm × 7 mm footprint with a 6 mm optical source and delivers up to 1600 lumens at 15 W, 85°C. Characterized at 85°C, the MK-R component is available in 2700 K to 7000 K color temperatures and offers minimum CRI options of 70, 80 and 90 (at selected color temperatures). The MK-R LED is the ninth product built on Cree’s SC³ Technology platform. 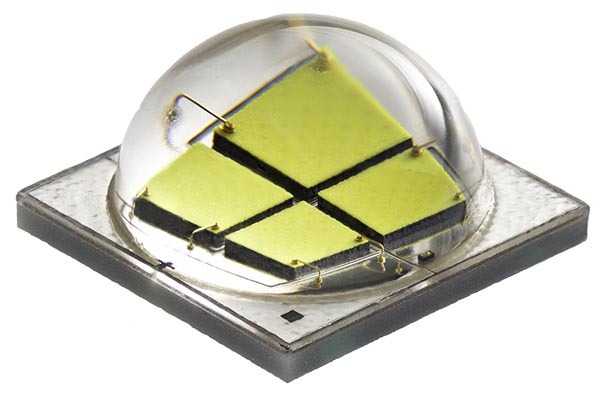 The innovative platform leverages Cree’s advanced silicon-carbide technology, features advancements in LED chip architecture and phosphor and boasts a new package design to deliver the most advanced LED components in the industry. Cree® XLamp MK-R LED samples are available now and production quantities are available with standard lead times.